Following his historic trip to the Arabian Peninsula, Pope Francis has returned to the Vatican and announced to his followers that Islam and Christianity are to form a coalition, working together to promote "common values." 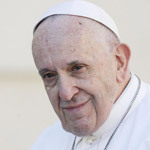 Upon returning from his Apostolic Journey in the Middle East, specifically the United Arab Emirates, the pope made the announcement before his general audience in St. Peter's Square on Wednesday. Pope Francis proclaimed his meeting with the Great Imam of Al-Azhar and their signing of the Human Brotherhood treaty, which aims to spread "authentic values" throughout the world while condemning all forms of religious violence. "The Great Imam of Al-Azhar and I signed the document on the Human Brotherhood, in which together we affirm the common vocation of all men and women to be brothers in. 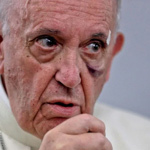 As God's sons and daughters, we condemn all forms of violence, especially those with religious motivation, and we commit ourselves to spreading authentic values and peace throughout the world," Pope Francis said. "It gives so much pressure to move forward in the dialogue on human brotherhood." The pontiff urged followers of both faiths to unite as one, allowing the different cultures and civilizations to live together without "clashing." By creating a unity between the two religions, Francis said that "together we affirm the common vocation of all men and women to be brothers, as God's sons and daughters." 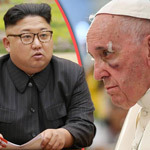 According to Daily Wire, the Holy Father said the document was meant to give a "clear and decisive sign" that different religions can respect each other in dialogue. 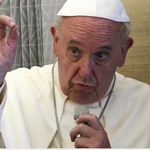 He also denounced the temptation to see a "clash between Christian and Islamic civilizations." "In an era like ours, in which the temptation to see a clash between Christian and Islamic civilizations is strong, and also to consider religions as sources of conflict, we wanted to give a further, clear and decisive sign that instead, it is possible to meet, it is possible to respect and dialogue, and that, despite the diversity of cultures and traditions, the Christian and Islamic world appreciate and protect common values: life, family, religious sense, honor for the elderly, the education of young people, and others," the Pope said. 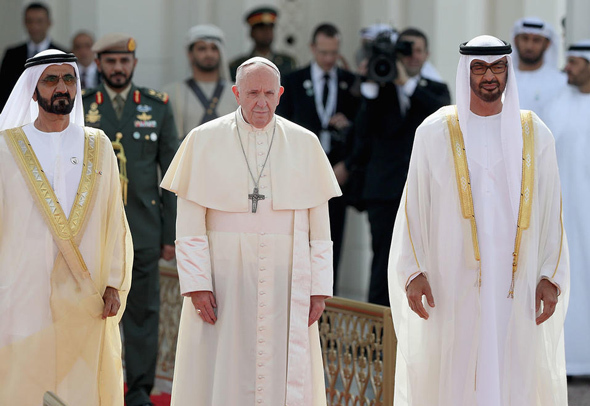 The Roman Pontiff's decision to visit the UAE was an entirely strategic one, given the country's progress in recent years by becoming a "crossroads of East and West." 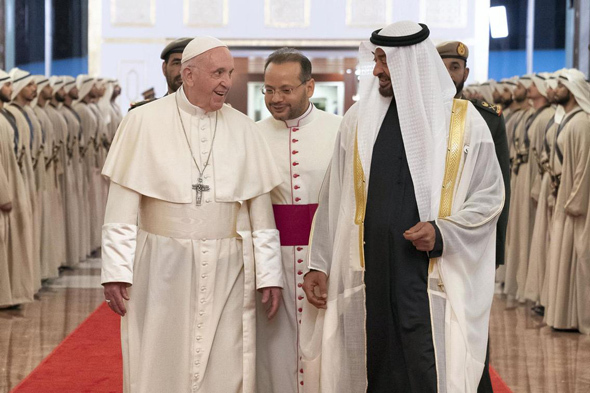 "That country has grown a lot in recent decades: it has become a crossroads between East and West, a multiethnic and multi-religious 'oasis,' and therefore a suitable place to promote the culture of encounter," Pope Francis said of the UAE. In perhaps his speech's most emotional moment, Pope Francis told the audience of meeting one of the UAE's first Catholic priests, who expressed deep joy despite being blind and confined to a wheelchair. "I had the opportunity to greet the first priest — ninety — who had gone there to found so many communities," Pope Francis said. "He is in the wheelchair, blind, but the smile does not fall from his lips, the smile of having served the Lord and of having done so well. I also said hello to another ninety-year-old priest — but that was walking and continuing to work." 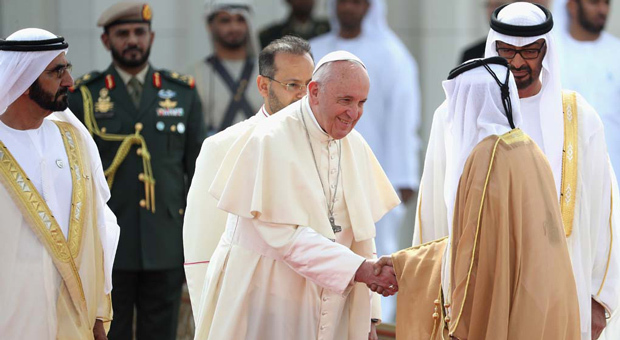 Pope Francis is the first Roman Catholic pontiff to visit the Arabian Peninsula, the birthplace of Islam. In recent days I made a short Apostolic Journey to the United Arab Emirates. A short but very important journey which, linking up to the 2017 meeting in Al-Azhar, Egypt , has written a new page in the history of dialogue between Christianity and Islam and in the commitment to promote peace in the world on the basis of human brotherhood. For the first time, a Pope went to the Arabian peninsula. And Providence wanted it to be a Pope by the name of Francis, 800 years after the visit of St. Francis of Assisi to the sultan al-Malik al-Kamil. I often thought of Saint Francis during this journey: he helped me to keep the Gospel, the love of Jesus Christ in my heart, while I was living the various moments of the visit; in my heart there was the Gospel of Christ, prayer to the Father for all his children, especially for the poorest, for the victims of injustices, wars, misery ...; prayer because the dialogue between Christianity and Islam is a decisive factor for peace in today's world. I sincerely thank the Hereditary Prince, the President, the Vice President and all the Authorities of the United Arab Emirates, who welcomed me with great courtesy. That country has grown a lot in recent decades: it has become a crossroads between East and West, a multiethnic and multi-religious "oasis", and therefore a suitable place to promote the culture of encounter. I express my gratitude to Bishop Paul Hinder, Vicar Apostolic of South Arabia, who prepared and organized the event for the Catholic community, and my "thank you" extends with affection to the priests, religious and laity who animate the Christian presence in that land. I had the opportunity to greet the first priest - ninety - who had gone there to found so many communities. He is in the wheelchair, blind, but the smile does not fall from his lips, the smile of having served the Lord and of having done so well. I also said hello to another ninety-year-old priest - but that was walking and continuing to work. Good boy! - and many priests who are there at the service of the Christian communities of the Latin rite, of the Syro-Malabar, Syro-Malankara rituals, of the Maronite rite that come from Lebanon, India, the Philippines and other countries. In addition to the speeches, in Abu Dhabi one step was taken: the Great Imam of Al-Azhar and I signed the document on the Human Brotherhood , in which together we affirm the common vocation of all men and women to be brothers in As God's sons and daughters, we condemn all forms of violence, especially those with religious motivation, and we commit ourselves to spreading authentic values and peace throughout the world. This document will be studied in schools and universities in several countries. But I also recommend that you read it, know it, because it gives so much pressure to move forward in the dialogue on human brotherhood. In an era like ours, in which the temptation to see a clash between Christian and Islamic civilizations is strong, and also to consider religions as sources of conflict, we wanted to give a further, clear and decisive sign, that instead it is possible to meet, it is possible to respect and dialogue, and that, despite the diversity of cultures and traditions, the Christian and Islamic world appreciate and protect common values: life, family, religious sense, honor for the elderly, the education of young people, and others. About a million Christians live in the United Arab Emirates : workers from various Asian countries. Yesterday morning I met a representation of the Catholic community in St. Joseph's Cathedral in Abu Dhabi - a very simple temple - and then, after this meeting, I celebrated for everyone. They were so many! They say that among those inside the stadium, which has capacity for 40 thousand, and those who were in front of the screens outside the stadium, it was 150 thousand! I celebrated the Eucharist in the city stadium , announcing the Gospel of the Beatitudes. In the Mass, concelebrated with the Patriarchs, the Major Archbishops and the Bishops present, we prayed in a special way for peace and justice, with special intention in the Middle East and Yemen. Dear brothers and sisters, this Journey belongs to the "surprises" of God. We therefore praise him and his providence, and pray that the scattered seeds bear fruit according to his holy will.